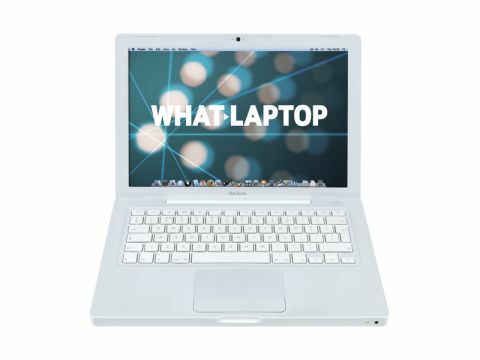 Apple laptops are often the choice of design professionals, but the MacBook (£699 inc. VAT) is aimed at home users. Its excellent software compatibility, battery and usability impress, making it a great alternative to Windows-based systems. The chassis weighs 2.3kg and with a depth of just 28mm, it slips easily into hand luggage. Its 320-minute battery life, under test, is ideal for long-haul journeys. The glossy white design is prone to scratches and ﬁngerprints, however, and requires suitable protection. The keyboard is comfortable and accurate to use, but the white keys quickly attract dirt. The touchpad is larger than on most laptops, and makes it easy to manoeuvre onscreen. The 13.3-inch screen keeps the chassis portable, but is large enough for comfortable use. Images are sharp and colours strong, so photos and videos look great. It's not as bright as we'd have liked though, and appears dull in bright conditions. Graphics performance is average, but suits home use. The integrated Intel GPU lets you edit home photos and videos. Apple's iPhoto and iMovie software is installed for such use. Basic gaming is also possible, but few games are available for Apple laptops. General performance is far stronger. The dual-core Intel processor and 1024MB of memory are common at this price, but ideal for home use. Apple software is designed to encourage users to multitask, and this speciﬁcation lets you smoothly work with multiple applications. Apple's OS X operating system divides opinion and is worth trying before you buy. It shares similarities with Microsoft Windows, but can take new users a while to grow accustomed to its differences. Its intuitive usability arguably betters Windows in many ways, however. Apple makes it easy for Windows users to switch OS. Built-in software lets you install Windows XP or Vista alongside OS X, and move between them as necessary. Apple is the only manufacturer to offer this as standard. Pre-installed Time Machine software lets you easily back up essential ﬁles, but storage options are poor. The 120GB hard drive is basic and bettered by many rivals in this group. DVD access is also read-only, but you can write ﬁles to CD-R. There is also no support for media cards. If you need an affordable Apple laptop, the MacBook is the only way to go. Its limited speciﬁcation may deter power users, but the great battery life and market-leading software compatibility are hard to beat, and moving to OS X could be a revelation for you.